Canadian Smart dealers not going anywhere, unlike those in U.S.
Fifty-eight U.S. Smart stores plan to shift to service-only for the ForTwo. All 59 authorized Mercedes-Benz dealers in Canada will continue to sell electric versions of the Smart microcar as the automaker does away gasoline-powered versions in North America. Smart announced in February it would drop gasoline-powered models in Canada and the United States and move exclusively to EVs this summer after exhausting inventory of the old models. Mercedes-Benz Canada spokeswoman JoAnne Caza told Automotive News Canada there are still some gasoline-powered Smart ForTwo models for sale on dealer lots across Canada. She also said all 59 Canadian dealers will continue to service older gasoline-powered Smart cars. Total sales of Smart cars, including electric and gasoline-powered vehicles, have plummeted in Canada this year, down to just 219 through July 31. That’s a 66.5 per cent decrease from the 653 sold through the first seven months of 2016. Caza said there's a reason those numbers look so skewed in Canada. "Sales are a reflection of the smaller inventory we have on ground at this particular time," wrote in an email. "The electric ForTwo models are starting to come in as we speak." It’s a similar sales story south of the border. In 2016, Smart sold 6,211 ForTwos in the United States, down 17 per cent from a year earlier. Sales this year through July are down 30 per cent from a year earlier, to 2,165 cars. Two thirds of Smart retail outlets in the United States have opted to stop selling Daimler AG's microcar brand after it switches to offering only electric vehicles. The shakeout will leave Smart with just 27 U.S. dealerships, fewer than even Lamborghini and Lotus. 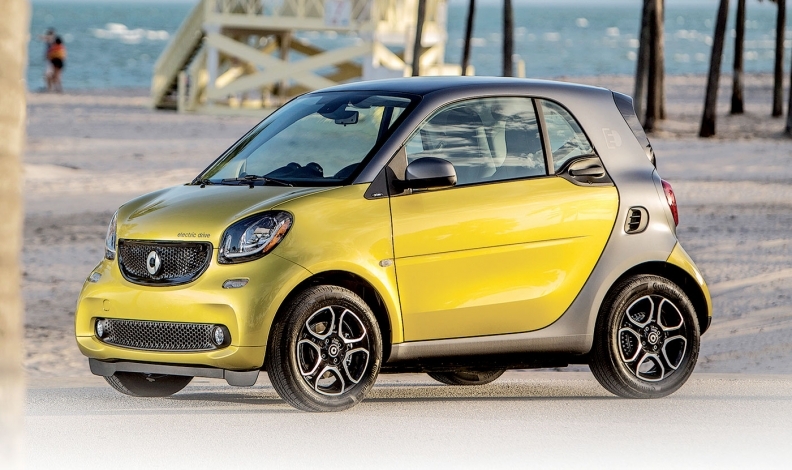 Mercedes-Benz USA, which distributes Smart in the U.S., asked dealers to decide by the end of June whether to continue selling the ForTwo two-seater, the brand's sole nameplate. Of Smart's 85 outlets, 27 said they would remain, while 58 said they would move to a service-only operation, said company spokeswoman Donna Boland. Those numbers are preliminary, she said. New gasoline-powered 2016 and 2017 ForTwos also remain in stock at U.S. dealerships, according to Smart USA's website. The U.S. dealerships that end Smart sales will also continue to provide service for Smart owners. The 27 remaining U.S. Smart dealerships are largely concentrated in states with zero-emission vehicle mandates and that give Smart "the highest market penetration potential," Boland said. Daimler executives had said they expected the remaining dealerships to be in cities such as San Francisco, New York, Los Angeles, Miami and Portland, Ore.
Electric Smart sales in Canada paint a similar penetration picture. Sales are concentrated in the three provinces that offer government incentives on the purchase of hybrid and all-electric vehicles. Fleetcarma, a company that tracks electric vehicle sales in Canada, keeps a running total of the country’s EV fleet. As of June 30 2017, it found there were 543 electric ForTwos sold in Ontario, 338 in Quebec and 223 in B.C. The redesigned ForTwo Electric Drive coupe and convertible are slated to go on sale in North America before the end of summer, still as 2017 models. Greg Layson of Automotive News Canada and Amy Wilson of Automotive News contributed to this report.